Foods that help with depression. It is very much the need of time. As the life is getting faster, our food habits are changing. The fast changing unhealthy food habits have now started taking a toll on people’s health. Lifestyle diseases have crept in our lives. It is now proved that fast food adds to depression. Is there any fallout of the food, we eat, when we are in depression. Yes, there is a definite link between food and depression. Choosing good food at good mood and bad food at bad mood actually affects health. Bad diet during depression times could adversely affect your health. Bad food habit can actually aggravate the depressed mood. It can make you feel worse. Diet does help to cope up with depression, but what to eat and what not, should be kept in mind. Make sure about the food you are taking in doesn’t contain substances that aggravate your mental state. There are a number of factors that adds to the depression. Food is one of them, which is often neglected. If we add healthy foods which contains large amount of proteins, nutrients, fruits and vegetables in our diet at the time of blues, it will definitely play a major role in pumping energy level and maintaining mental focus. 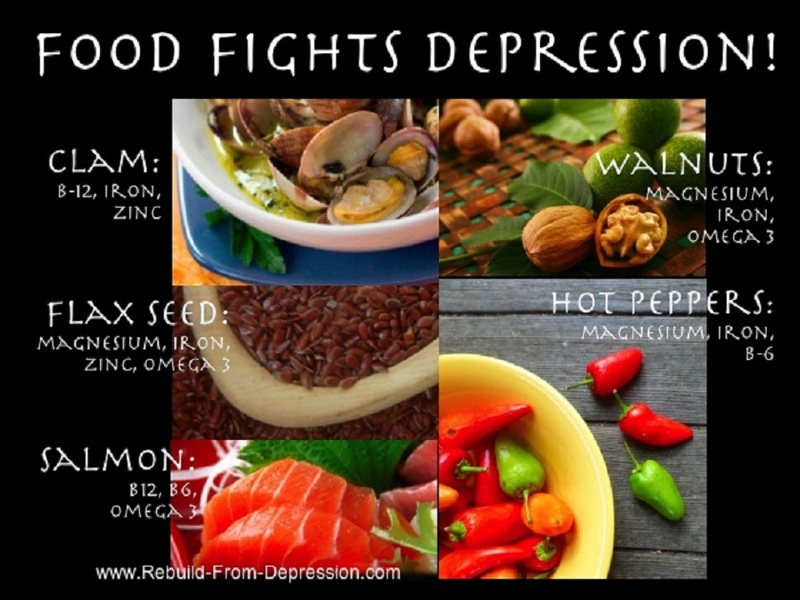 There are no specific foods to cure depression, but certainly there are some foods that help with depression. Whereas, foods which contains saturated fats, caffeine, refined sugar and heavily treated ingredients, preservatives, processed foods are dreadful. They are the major cause of worsening the depressive situation. Performing regular exercise with the proper diet routine is as good as icing on the cake. Dark green leaves hold the top spot to beat depression. There is no contest with green color food. Green Leaves contain zillions of essential and important vitamins like vitamin A, C, E & K, powerful immune-boosting minerals and phyto-chemicals holding anticancer effects. Green spinach, beans, kale, onions, berries, Swiss chard encounters all types of inflammation in human body including the brain inflammation or depression. As our body does not produce omega 3s for its own, so in such case, the only way, we can get it is by eating. Omega-3 fatty acids are abundantly present in walnuts. This plant based source of omega-3 fatty acids guide proper brain functioning and scale down depression symptoms. Oily fishes such as salmon, albacore tuna, herring are rich producer of omega 3 acid. It also includes serotonin, which helps in building neurotransmitter and regulating mood. Other than these benefits, these acids also helps in lowering the risk of heart related diseases. It also improves the circulation of blood in the body. Low fat dairy products are certainly a food that helps with depression. Low fat cheese, skim milk, other products (dairy) has a factual impact on depression. These products are the two main sources of calcium and vitamin D and some specific proteins, which promotes the sense happiness and alleviation. The reason why mushrooms help during depression, is that it lowers the sugar level of the body and thus elevates your mood. It is certainly a good food for mental health. Well, everyone is aware of the benefits of having an apple a day, the same works at the time of depression. The antioxidant agents present in this fruit help in preventing brain inflammation and repairs oxidation damage at the cellular level. Getting back to nature is the need of time. Foods That Help With Depression are very much the one that are gifted by nature. Along with Food to fight with depression also give a try to massage therapy, Yoga and various other measures to stay well.